What is PowerApps Preview Program? PowerApps updates the platform and its capabilities every few days or weeks. PowerApps Preview program is a way to get early access to those upcoming functionalities and updates, prior to, them being available in rest of the regions (where customer’s production apps are deployed). Try out, learn, and dogfood upcoming functionalities. Many functionalities will be rolled out first in the preview, for few days, to get feedback. By participating in Preview program, users can learn about new functionalities sooner, and as well provide feedback on it. Also, users will be ready to quickly take advantage of new functionalities as soon as they reach regions where their production apps are created. Enable business continuity by ensuring their current apps will continue to work with the upcoming updates (vNext) of PowerApps. What all in PowerApps is available for preview? To access the preview functionalities across PowerApps, you need to be in context of a preview environment (More details on the preview environment are given in the next section). Currently we will be rolling out preview for following scenarios across PowerApps. 1. Creating apps: Customers can create canvas-based apps using the next version of PowerApps. This can be done by creating apps in a preview environment. Current limitations include – Model driven apps can’t be built in preview program and we are working on it. It is in our backlog to support this scenario. 2. Managing apps: You can manage and share apps using PowerApps web portal. To access the preview functionalities, all you need to do is to be in context of the preview environment, and it should take you to the preview version of PowerApps web portal. 3. Playing apps: You need to play the apps, in a preview environment, using web player. When you do that, you will be automatically taken to preview version of web player. (Apps will play with the vNext version of PowerApps web player). Current limitations include – PowerApps Mobile for iOS, Android, and Windows are currently not available for preview. If you play the apps created in the First Release environment, then they might not work. It is in our backlog to support this scenario with preview program. How to get early access to the upcoming updates? 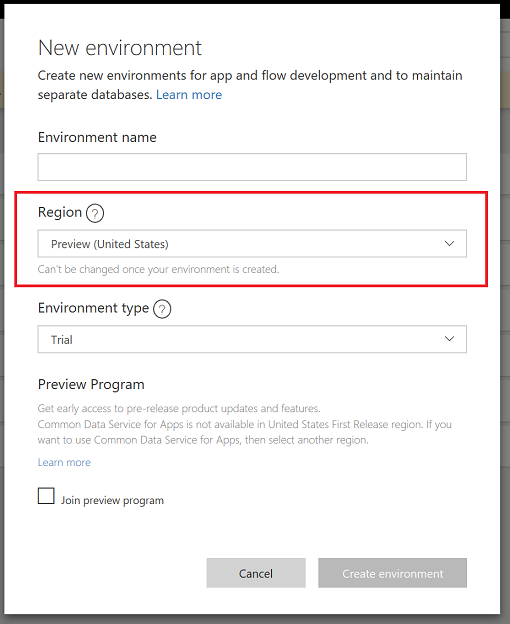 On selecting the region for the environment as Preview (United States) and accepting the consent for joining the Preview Program, you can create the environment to get access to the next version (vNext) of PowerApps. All the apps and other resources created in this environment are on vNext version of platform (SAAS). How to learn about the latest updates? You can get aware of the new functionalities which are available for preview at What’s new in PowerApps. The functionalities which are just available in the preview have a ‘Preview’ tag. You might like to verify your production apps, to be working fine with the next upcoming updates on PowerApps. You can copy the apps from production environment to an environment in First Release and play the apps to test out the scenarios. Please note, all the other necessary resources like CustomAPI, Flow, etc. will also need to be moved along with it. This should just create another copy of these apps and required resources, and you can start testing out the newer updates not just for playing an app, but also while editing and managing the apps. We will be launching many new functionalities initially in the Preview (United States) region. You can try out the new functionalities prior to it being available in rest of the regions (which might impact your production environment). How to provide feedback to the product team? You can provide feedback on the PowerApps forum and as well open contact support for it. What are the known issues and limitations? As mentioned above, desktop studio in Windows is not available in preview. Hence, creating or editing of the apps in the preview environment might not be compatible with your Desktop Studio and shows the following error message. In such a case, we recommend you use Web Studio to create or edit an app in the preview environment. 3. Database cannot be created in Preview region. Currently, you cannot create a database with Common Data Service for Apps in an environment in Preview (United States) region. This is in backlog.